The journey to better health & wellness starts here! For over 30 years as a medical doctor, I have been practicing the holistic approach, integrating evidenced based medical and nutritional management. The patients who have benefited include those with chronic tiredness, energy depletion, reduced mood, depression and anxiety, high blood pressure, heart disease, diabetes, irritable bowel, children’s behavioural disorders, food allergies and intolerances. Many patients have an instinctive gut feeling that there is more to their situation than just what meets the eye and want more insight into how the body functions as a whole. With this insight often comes the understanding that the food-body-mind connection is at the heart of ones health and wellbeing. Despite spending a lot of time searching for information many find it difficult and even overwhelming to gain insight. Information overload, fueled by unconnected, incomplete and conflicting advice often leads to confusion and despair, and finding it difficult to get to the core truth, and find answers. This site is designed to empower, guide and educate you, and provide strategies and support that will benefit you for a lifetime! 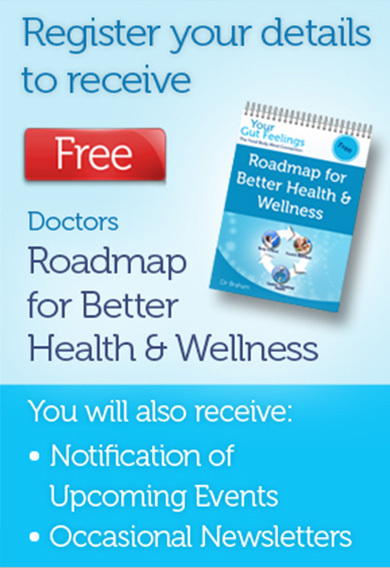 You can start by reading “Dr Braham’s Roadmap for Better Health & Wellness”available FREE when you sign up to our newslist (located on the right). Wishing you the best of health and wellness! Your body and mind are part of a holistic health picture. Symptoms such as chronic tiredness, energy depletion, depression, anxiety, hormonal, autism and child behaviour problems, high blood pressure, heart disease, diabetes and weight issues may be related to your nutrition and gastro-intestinal health. The Gastro-intestinal tract is the ‘gateway’ whereby food nourishes your body and mind while at the same time removing any harmful chemical substances. Symptoms an conditions include heart burn, reflux, irritable bowel syndrome, bloating, abdominal pain, constipation, diarrhoea and bleeding. Your nutrition is the foundation for all the cells and organs in your body. Our health and wellness is related to the quantity and quality of the food we consume. Your nutrition plays a significant role in gastro-intestinal health and affects your body and mind. The relationship isn’t always obvious.